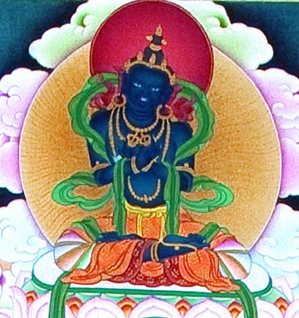 Vajrayana (Skt. vajrayāna; Tib. རྡོ་རྗེ་ཐེག་པ་, dorje tekpa, Wyl. rdo rje theg pa) or 'Vajra Vehicle'. The teaching, and practice, of the Vajrayana or ‘Secret Mantra Vehicle’ lies at the heart of the Mahayana Buddhist tradition of Tibet. Based on the motivation of bodhichitta—the wish to attain, for the sake of others, the state of complete enlightenment—the Vajrayana is a path centred on cultivating pure perception. It contains many powerful methods for accumulating merit and wisdom, in order to arrive swiftly at a direct realization of buddha nature and the nature of reality itself. Through the practices of visualization, mantra recitation and meditation, ordinary perception is transformed into a ‘sacred outlook,’ where everything is seen and experienced purely in its true nature. The Vajrayana is not a separate vehicle from Mahayana, but actually belongs within Mahayana as a distinctive vehicle of skilful means. the extremely sharp faculties of the individual. It is rich in methods and without difficulties. It is for those with sharp faculties. The mantra vehicle is especially sublime. ↑ Jamgön Kongtrul & Jokyab Rinpoche also mention six, seven, or twelve ways in which the Mantrayana is superior to the Sutrayana. See The Light of Wisdom Vol. One, translated by Erik Pema Kunsang (Boudhanath: Rangjung Yeshe Publications, 1999), pages 154 & 280. Khenpo Ngawang Pelzang, A Guide to the Words of My Perfect Teacher (Boston & London: Shambhala, 2004), page 5 and ‘1.2. Vast Skill in Means: The Attitude of the Secret Vidyadhara Mantrayana’, pages 31-34. Padmasambhava & Jamgön Kongtrul, The Light of Wisdom Vol. One, translated by Erik Pema Kunsang (Boudhanath: Rangjung Yeshe Publications, 1999), pages 152-155. Patrul Rinpoche, The Words of My Perfect Teacher (Boston: Shambhala, Revised edition, 1998), ‘1.2 Vast Skill in Means: The Attitude of the Secret Mantrayana', pages 8-10. Tulku Thondup, Masters of Meditation and Miracles, edited by Harold Talbott (Boston: Shambhala, 1999), page 10. Thinley Norbu, The Small Golden Key (Shambhala Publications, 1999), ‘6. The Superiorities of Mahayana and Vajrayana’, pages 35-37. This page was last edited on 18 December 2018, at 09:15.